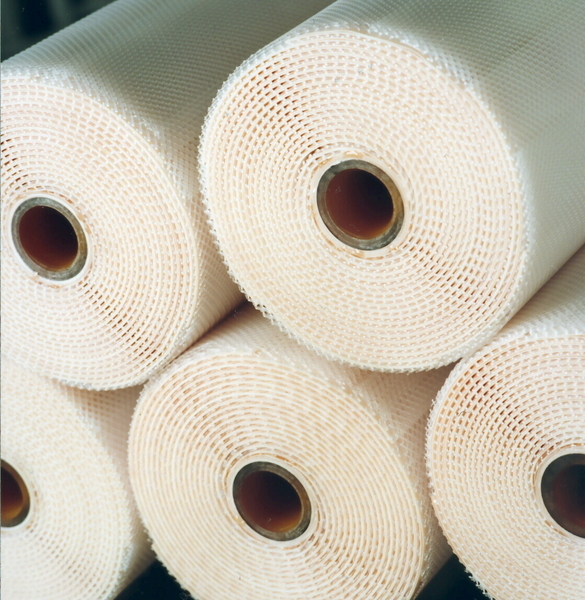 Today’s water treatment technologies are effective but not always efficient. 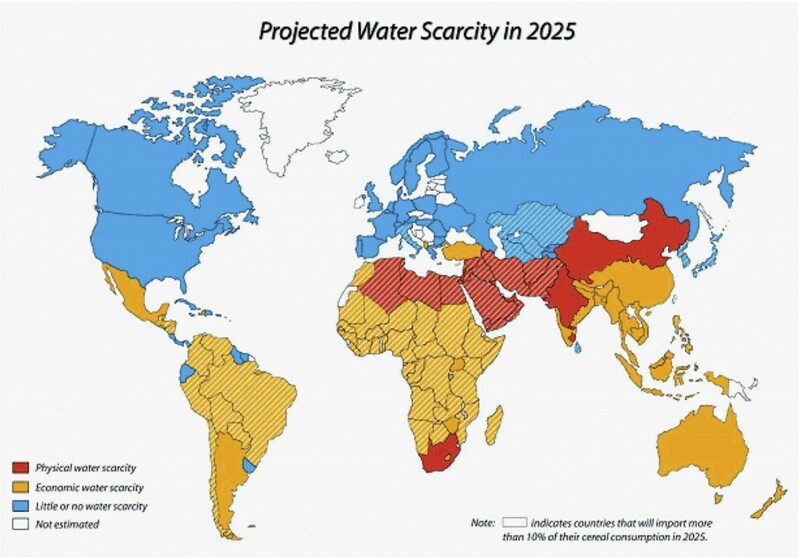 As a result, considerably more energy will be needed to replenish ever dwindling fresh water resources in the near future, however, less energy will be available to do so. One potential solution to this challenge is forward osmosis based water treatment systems. In today’s world where energy prices are increasing, due to over-utilization of fossil fuels, and fresh water resources are declining, energy efficient water treatment technologies are becoming increasingly important for sustained global development. This is especially true because of the linkage of water and energy in what has been coined the water-energy nexus, where – on one hand – water is required in all forms of energy production (either in the energy production process itself or to generate raw materials), and – on the other hand – energy is required for all forms of water treatment. The water-energy nexus drives development of ever more efficient water treatment technologies. 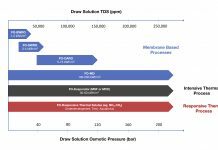 However, traditional pressure driven membrane technologies, such as reverse osmosis, nanofiltration, ultrafiltration, and microfiltration, are reaching their efficiency limits. As an example, McGovern et. al. recently treated the topic of energy consumption in seawater desalination processes (McGovern et. al., JMS, 2014). Here, the theoretical energy requirement for direct desalination of seawater (35000ppm, 50% recovery) is reported at 1,05 kWh/m^3. Throughout the last 30 years of research into improving the efficiency of reverse osmosis technologies, current RO systems are able to desalinate seawater at 47% thermodynamic efficiency corresponding to an energy usage of 2,34 kWh/m^3. 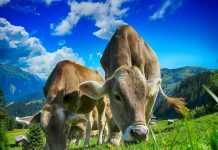 Researchers agree that this number will be very hard to improve significantly in the future, and similar arguments apply for nanofiltration, ultrafiltration, and microfiltration technologies. Hence, in order to radically improve the efficiency of water treatment systems, new technologies are needed. 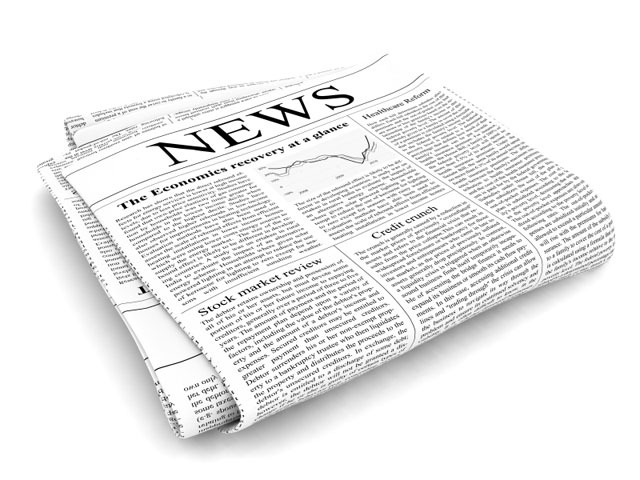 One such technology, which has been gaining increasing interest the last 10 years, is forward osmosis. 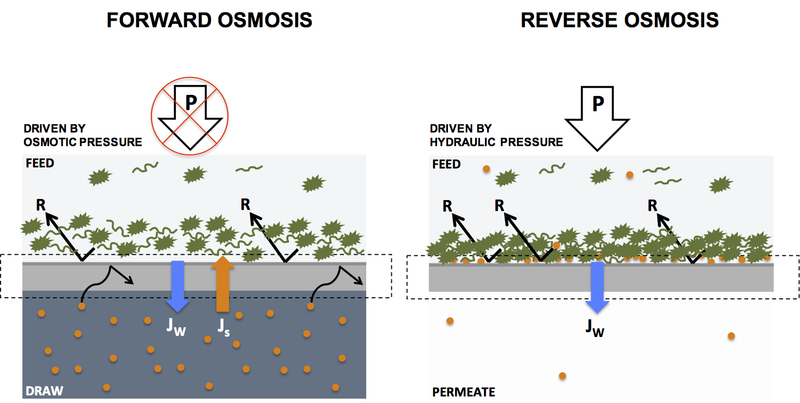 According to ForwardOsmosisTech, forward osmosis is “the process of spontaneous water diffusion across a semi-permeable forward osmosis membrane in response to a difference in solute concentrations (i.e. osmotic pressures) on either side of the semi-permeable membrane”. 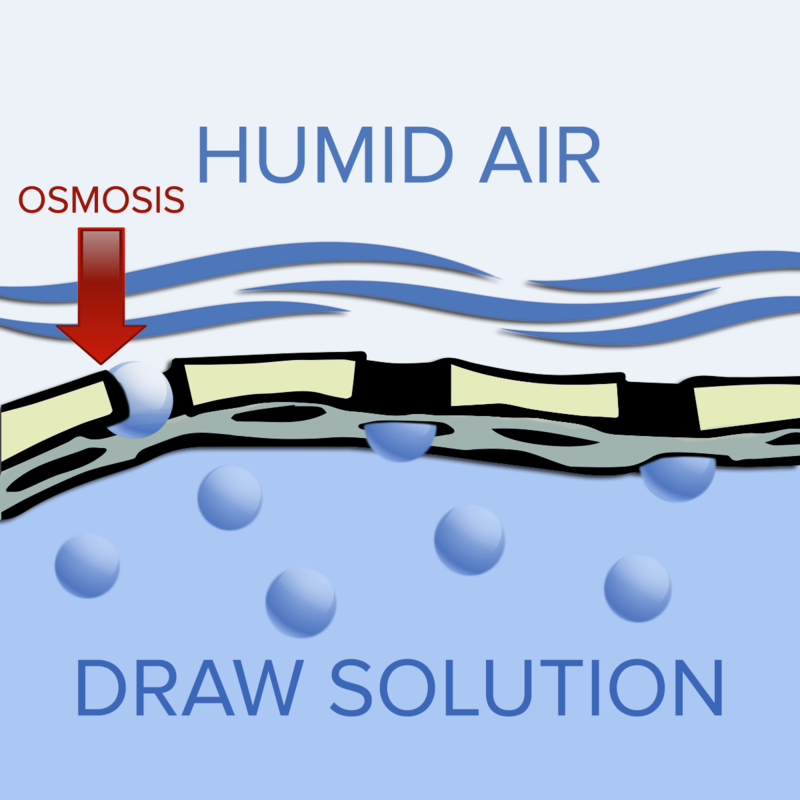 The figure below shows a schematic diagram of a forward osmosis process in action. 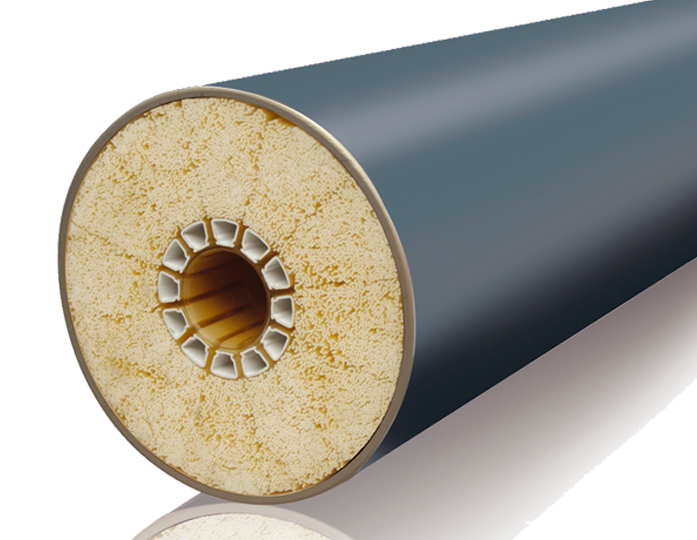 Since forward osmosis processes are driven by osmotic pressure and not energy-consuming hydraulic pressures, the process of water diffusion across a forward osmosis membrane comes at zero energy costs. 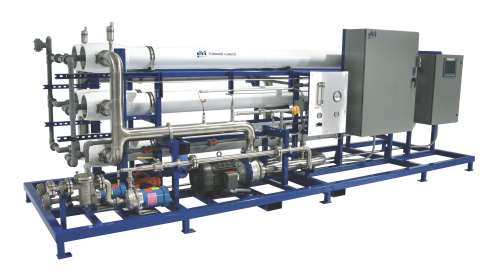 In fact, all that is needed – in form of energy usage – to operate a forward osmosis system is pumps for circulating feed and draw solutions across either side of the membrane. Researchers (McGovern et. al., JMOS, 2014 and McGinnis et. al, Desalination, 2007) have estimated the energy usage in forward osmosis systems to be in the region 0,16 kWh/m^2 to 0,25 kWh/m^3. This is one tenth of the energy usage of RO systems for desalination of seawater. These value generators are extremely useful for industrial process optimization in factories / plants where concentration of low concentration streams and dilution of high concentration streams are handled separately. Examples of such factories / plants can readily be found in the oil & gas industry, the textile industry, and the white biotech industry. 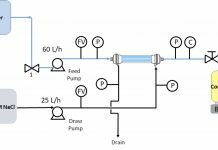 To further clarify the energy saving potential of forward osmosis-based water treatment systems, imagine a factory with a process stream that must be diluted with fresh water before down stream processing can take place (the concentrate (draw) arrow in the figure below). 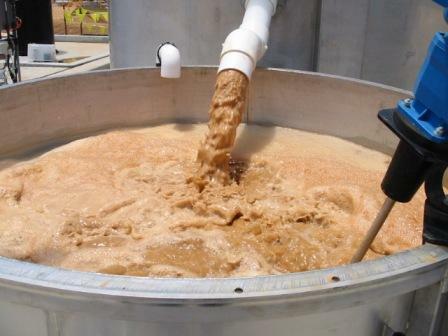 The same factory has a difficult wastewater stream that is dewatered in an energy-intensive system containing both reverse osmosis membranes and evaporators (the dilutate (feed) arrow) in the figure below). 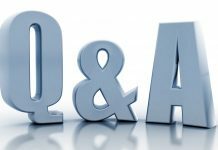 What does the future hold for forward osmosis-based water treatment systems? There are already a hand-full companies working hard to commercialize forward osmosis technologies in various industrial applications. However, so far, broad market adoption has been limited. 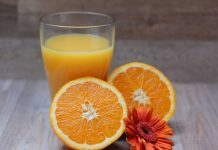 Mainly because of a lack of available system capacity as well as real-life case studies where the forward osmosis value proposition has been proven. 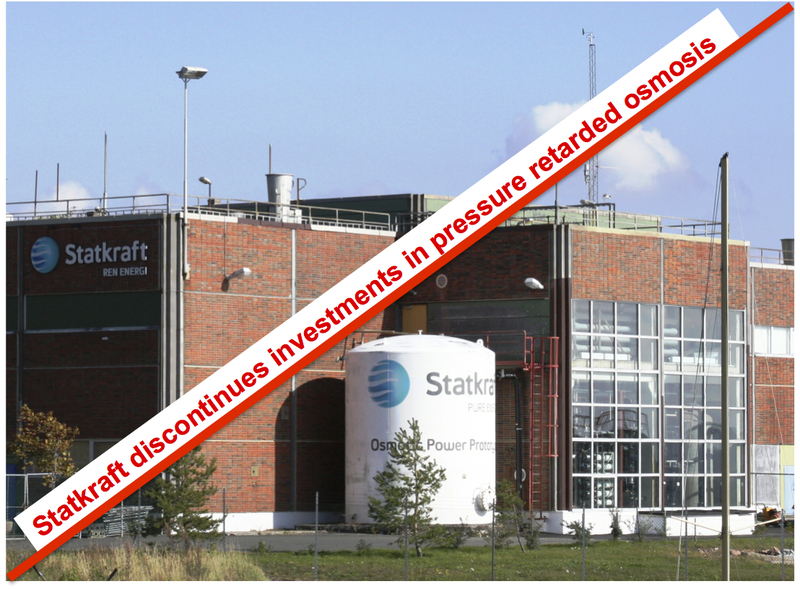 I expect this picture to change in the near future as more test-bedding is completed and forward osmosis membrane manufacturers are successful in up-scaling their production capacity.